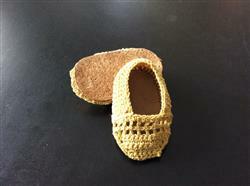 The Elena PDF Shoe Pattern will help you create an adorable crocheted slip-on shoe for your 18" doll. The top features a crocheted lattice, perfect for pairing with summery fashions. The top of the shoe is crocheted in two simple pieces that are sewn together. It is then sewn to a prepared insole, and glued to the outer sole. Skill Level: Intermediate; The skill level has been rated intermediate because, while the crochet stitches and shapes are simple, thread can be a little tricky to crochet if you are not experienced with it. What You Get: One 18 page crochet pattern that you digitally download as a PDF file so you can start your project immediately! The PDF crochet pattern provides full color step-by-step illustrated instructions and full size pattern pieces. A PDF reader is required to view and print the files (example: Adobe Reader or Preview for MAC). The download link is received immediately after the transaction is complete. Print copies are NOT available. The shoes came out great. The pattern is very clear and easy to follow. I do not crochet often but had no trouble following the directions. It looks like I’ll be making a lot more! I fell in love with this pattern. I have made a lot of doll shoes, and even written a book on the subject, but using a blanket stitch on fun foam to attach the upper to the sole was brilliant! I highly recommend this pattern to anyone who enjoys crochet for perfectly fitting shoes for a special doll. This pattern is quick and easy to stitch up in an evening. it seems a bit tight on the doll with the large size soles in the pattern. I traced my doll's foot and created my own sole pattern, which fit much better. Very sweet shoes!